The glass atrium on a large public facility needed to be accessed for repairs, maintenance and cleaning. The system needed to allow for access across the entire surface of the atrium and also allow for technicians to be able to safely undertake repairs as required (including potential replacement of glass panels). Scaffolding would be costly and only provide a temporary solution. Additionally, it would have to be re-installed on the rooftop any time the atrium needed to be inspected or repaired. Because of its rooftop location, the atrium was also situated in an area where access was not possible for cranes so the system would need to be transported to the site by hand and assembled in-situ. The structure needed to be lightweight so as not to exert too much of a load on the rest of the building, be able to be stored in an out-of-site area, and be able to be accessed quickly and easily by skilled technicians at any time. With that long list of requirements, Bomac worked with structural engineers and rope access team Absafe to develop a light-weight, bolt-together rolling platform. Technicians could walk up and down the stairs and across a platform to access the areas required. The walkway created an arc over the atrium and could be easily rolled from one end to the other, offering access to every face of the half-cylinder shape of the atrium. 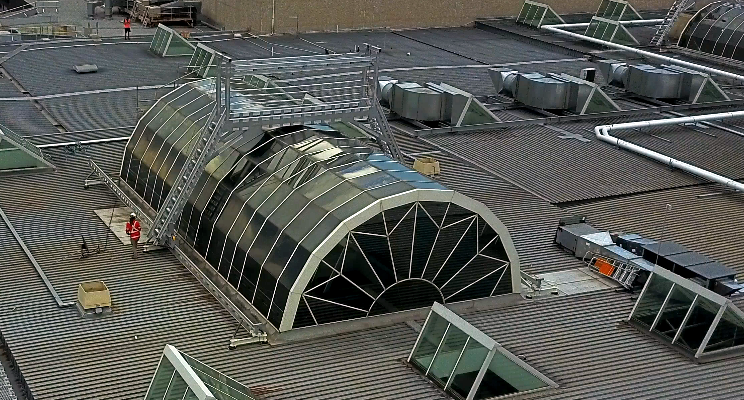 The walkway also integrated the rope access aspect of Altrac, allowing users to clip on and safely inspect or repair the glass without risk of fall from height. Due to the lightweight nature of Altrac and StrongBac, negligible extra strain was placed on the building. The walkway can be stored on-site and easily put in place as needed. The end client can now undertake cleaning, maintenance and repairs safely and efficiently without incurring additional expense and ongoing risk of re-installing scaffolding each time access is required.